We local NORBAG members had our annual holiday social and “card” exchange on December 10, 2016. Approximately 30 of us attended. Sandy V. hosted the event at her home. This is our hostess, Sandy, in the kitchen with all of our nibbles. We each brought a small plate of finger foods to share. Those of us who had signed up in advance to participate in the card exchange also brought our cards. This is something like a cookie swap. 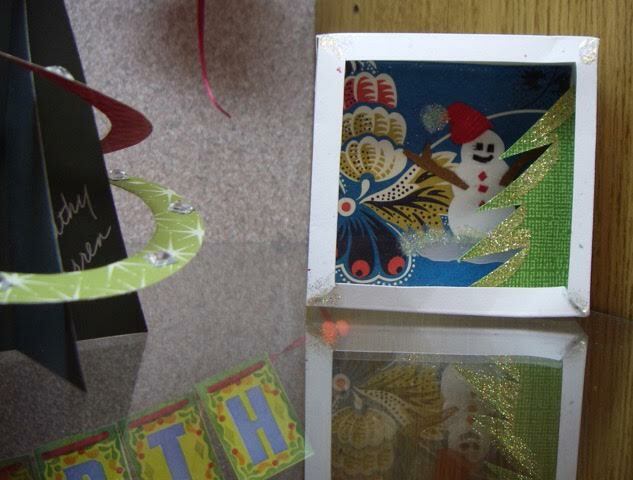 We bring as many “identical” cards as there are people signed up plus one for the NORBAG library. This year we had 31 participating (10 from out of town). The cards are all arranged on a table along with name tags. It is quite an impressive display. Then we line up and walk around the table collecting one of each of the cards (including our own). Then the fun starts. Dolores calls a name and and that person tells about making the card or the inspiration for making the card. There is a lot of laughter and fun. Val H. and Leila S.
Diane W. and Becky M.
On couch: Peggy M. and Kay C.
Behind: Barbara C., Edge G., Lynne (behind lamp) Susan B., Beth M. and Diane W.
Kitchen: Connie S. and Alex S. Ellen G.
At pillar: Ellen G. Chairs on right: Becky M., Barbara C., Lara C., Edge G.
Be sure to click on the Flickr Gallery link to see photos of all of the wonderful holiday cards. It's time for the annual NORBAG Holiday Get-Together and Card Exchange. Once again, Sandy Vrem has graciously offered her home in Arcata for the event. 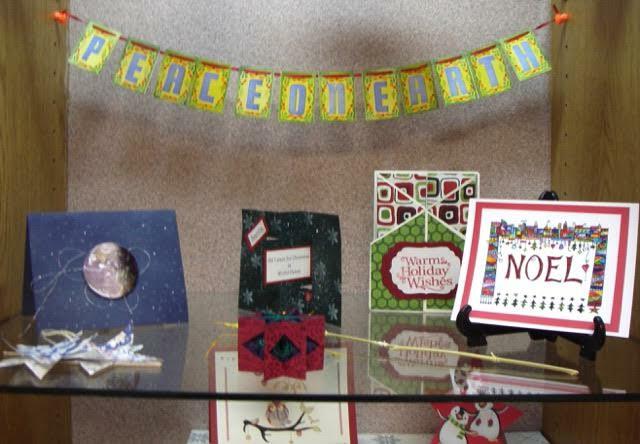 You do not have to be participating in the card exchange to join in! Everyone is invited and asked to bring a goody to share (please, nothing too gooey - finger foods are requested). We will not have the library with us at this gathering, but there will be a box so you can return any books you may have checked out. The Holiday card exchange is a favorite event because the cards are always so creative and different...year after year. 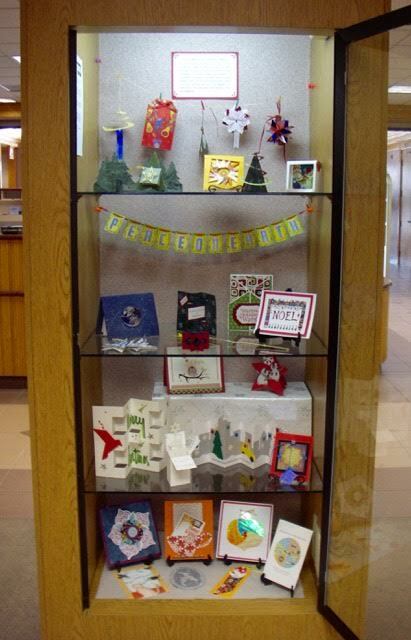 Currently there is a display of holiday cards from past years in the kiosk of the Humboldt County Library. There are cards that celebrate Hanukkah, Christmas, and the winter solstice. 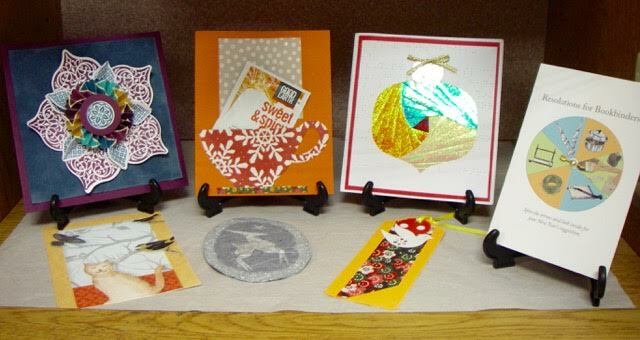 In this exhibit cards feature form, color, and even "dangliness". Thanks go to Lynne Gurnee for setting up the display and providing the photographs. This month's meeting was a lot of fun. Our book exchange had 17 miniature books. Eight of them were from out-of-towners. (Make sure to stop back by here after the first of the month to see the pictures of the books by tapping on the Guild Flickr Gallery button to the left.) We had a full house for the meeting. Lara Cox led our workshop. She showed us how to make one version of a tunnel book, but everyone had such creativity that there was a lot of variety in the books that were made. Lara brought some samples to show us many variations and how to customize our books. 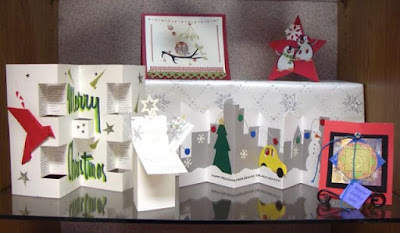 We started by making the base of the tunnel book which is the accordion fold. Then we moved on to looking at the layers that would fill the book. There were several different methods of adding to the frames. 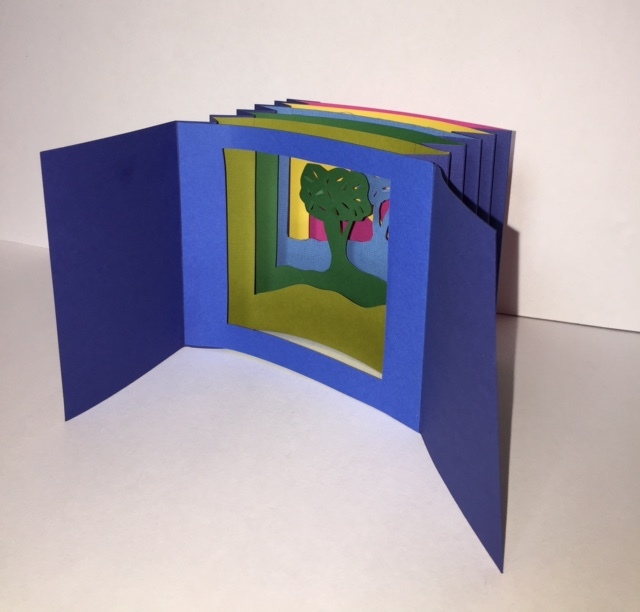 This member has a single picture and is now carefully cutting out the pages in the front to resemble trees that you look through to see the picture. Some simply devised a scene from each page color. We glued each page from back to front from only one side. Another view of inserting the pages. Then we glued the remaining side from back to front and called it done. We were all as happy as Michele H. is with this workshop. 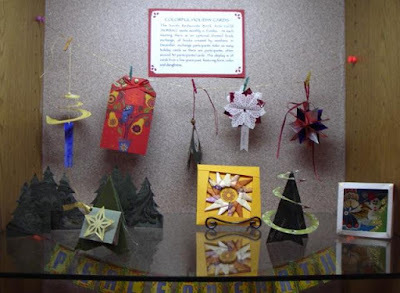 Artist's Books: "Chapter 9 - Local Heroes, Book Artists of Washington State" is the latest installation in the Sherry Grover Gallery upstairs at Bainbridge Island Museum of Art. It features books by 69 Washington artists. Downstairs there is an exhibit of work by Catherine Alice Michaelis, titled "Imprinted & Unbound". Catherine is best known for her artist's books and printmaking projects. Both exhibits will be showing until February 5, 2017. 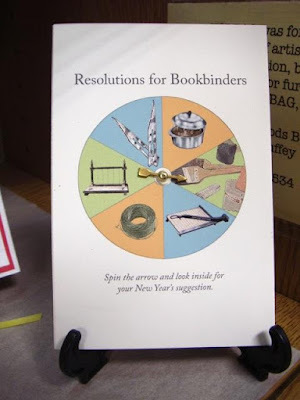 This is a great opportunity to see two wonderful exhibits of book art. For more information about these exhibits and museum hours check the website for details: https://www.biartmuseum.org/. Here is a small selection of some of the books in both exhibits. The November Tunnel Book workshop will be taught by Lara Cox. Tunnel books are fun to make and offer endless possibilities for design. They can feature a variety of themes, from telling a story to simple images or very complex sculptural designs. They are constructed in such a way that when you look through them, it gives the effect of looking at a 3-D landscape. They can have just a few "pages" or several. Use your imagination! Any images you may wish to incorporate NOTE: If you wish to focus on particular images bring several copies of that same image and see what can result! Instructions and examples to study. Your finished book will measure 5" x 4 1/4" tall and will have six pages including the back and front. The book will also have a front double sided cover (opening like double doors) with an optional slip band closure.